The bus was transporting children, all below the age of 13, who were studying at a private school. 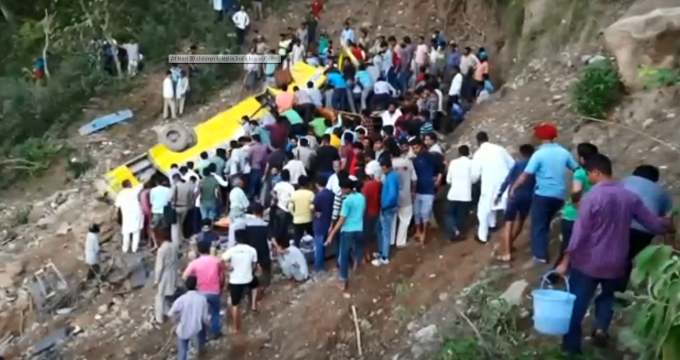 At least 24 children and three adults were killed when a school bus plunged off a mountain road in the northern Indian state of Himachal Pradesh on Monday, police said. Santosh Patial, a senior police officer in Himachal Pradesh, said they had recovered 27 bodies from the accident site. The adult dead included the driver. The tragedy occurred when the bus swerved off the road and fell into a gorge. The bus was transporting children, all below the age of 13, who were studying at a private school in Nurpur town, 300 km (185 miles) from Shimla, the state capital. “We have identified all the children and parents have been informed about the disaster,” said Ram Nath Singh, a police officer at the accident site. Singh said three children with head injuries were taken to a government hospital. India has the world’s deadliest roads, with almost 150,000 people killed in accidents in 2015, the latest government data shows. Prime Minister Narendra Modi expressed his deep anguish over the tragedy. “My prayers and solidarity with those who lost their near and dear ones in the accident,” he said in a tweet.